Russian Apple Pancake - Do You Know The Muffin Man? 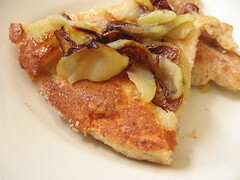 Notes: My ingredient choices: mix of low fat cow and soy milk; 1 cup cake and pastry flour plus ½ cup hard whole wheat flour; Granny Smith apples. The yeasted batter (with raw egg and milk) needs to rest for 6 to 8 hours, so I put it near an open window where it wasn't too warm. The batter wasn't quite cooked after the prescribed 5 minutes so my heat may have been a bit too low; but I'm not sure how a thick batter is supposed to cook in that amount of time. Broiling the cinnamon sugar in the oven took about 2 minutes. This pancake was a bit disappointing: more effort than the German apple pancake but didn't yield a tastier result. Sure, a yeasted pancake is novel but this is a fussy recipe for a morning meal.